Named for the Cardinal Camerlengo, who administers the Apostolic Chamber and in 1250 fiercely defended the local lands in the name of the Pope, was given the lands around Rapolla as a reward. Echoing this rich history Antonio Cascarano called their wine Camerlengo to summon these noble origins and to introduce their guests to the history and traditions of Rapolla, which is rooted in the past of ancient peasant wisdom. Antonio inherited the land from his grandfather, Giovanni Falaguerra, and revived the company that his grandfather created that was interrupted in the 1970's. 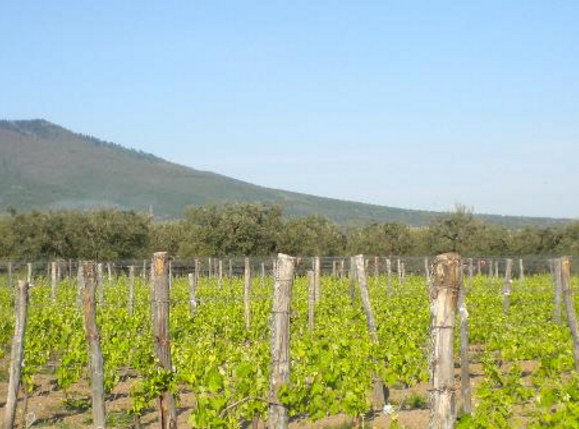 Located on the slopes of Mount Vulture, this land is rich in vineyards, chestnuts and olive trees. With soils fertile in silicon and potassium, along with wide diurnal ranges and rigorous grape selection during the harvest that creates the most structured and complex wines from his old vineyards (approximately 40 years) of Aglianico. It is this wonderful landscape where Camerlengo is located giving us a divine splendor of his vines. These are 10-12 year old vines planted in a site called 'Toppo d'Avuzzo' composed of volcanic-tufaceous and calcareous soils. These grapes are hand harvested between September 20 and October 10. The grapes are pressed and left to ferment with natural yeasts in chestnut vats with continuous punching for 15-20 days. The wine is then racked and allowed to settle for 48 hours before being transferred to tonneaux (800L) for two months. Unfiltered. These vines are aged from 8 - 12 years. The soil is clay with sandstone and volcanic deposits. These grapes are hand harvested in October. Fermented in chestnut oak and aged in 30/40/50 HL barrels. From 15 - 20yr old vines. Sandstone and Clay soil with volcanic deposits. The vineyard is 2.5ha 500 meters. Fermentation is done in chestnut wood and aged in chestnut barrels and Tonneaux oak.